A decision on whether to demolish an historic bridge in Leicester has been deferred for further consultation. Bowstring Bridge, which runs over Western Boulevard, carried Great Central Railway (GCR) trains but fell into disrepair after its closure. Fixing the bridge would cost about £750,000, but knocking it down would cost half the amount, the council said. Train enthusiasts from the Great Central Railway have now stepped in and offered to try and buy the bridge. Their sentiments are echoed by Leicester's Civic Society who earlier said Bowstring should be saved, as it was a lasting reminder of the railway. The council said it does not have the money for the repairs. 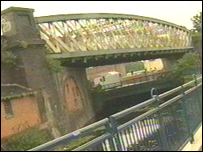 City councillor John Mugglestone said: "Up and down the country, councils have had to demolish bridges that have been left to them by the ex-British Rail. "There never was any money left to maintain them. "The insurance on this bridge will run out this year and we can't get it insured any more." The GCR ran from 1899 to 1969 and provided an alternate line from London to the Midlands and Manchester through Aylesbury, Brackley, Rugby, Lutterworth, Leicester and Nottingham. It was built with extra room between the track and the bridges above to allow for bigger trains. Part of the old GCR remains as a heritage railway in northern Leicestershire, and other stretches have been converted to nature walks, but much of the line through the city and neighbouring towns has been built on. John Burrows, Leicester Civic Society said: "It's cultural vandalism that makes me angry. "It's part, not just of the architectural and industrial heritage of this city but part of the railway heritage of the country." Two commercial attempts to reopen the line to freight traffic have failed in Parliament in the last decade, due to local opposition and government claims the financial plans did not stack up.